One of the original Greensboro four who took part in the Woolworth sit-ins, David Leinail Richmond is often described by those who were closest to him as “gentle, intelligent, generous to a fault, and able to take a stand.” He was born in Greensboro and graduated from Dudley High School. At North Carolina Agricultural and Technical College (now University) he majored in business administration and accounting. 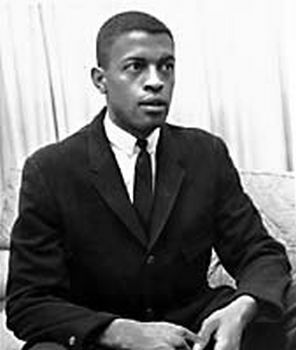 He got married while still at “A&T” and was immediately faced with the demands of his classes and the needs of his family, as well as the curious celebrity that went with the movement. David Richmond began to fall behind in his class work, cutting back on his course load, and as time went by he left A&T before receiving his degree. After leaving A&T, he became a counselor-coordinator for the CETA program in Greensboro. He lived in the mountain community of Franklin for nine years, then returned to Greensboro to take care of his parents and work as a housekeeping porter for Greensboro Health Care Center. In 1980, the Greensboro Chamber of Commerce awarded him the Levi Coffin Award for “leadership in human rights, human relations, and human resources development in Greensboro.” He was married and divorced twice and has two children with Yvonne Bryson. David Richmond never got his degree, moving instead from one job to the next, none of which, in the opinion of his friends, was a match for his abilities. He died of lung cancer on Dec. 7, 1990 at the age of 49. In a sense David’s life had peaked at the fragile age of eighteen, when he and his buddies decided together to protest segregation. A&T awarded him a posthumous honorary doctorate degree. Frye Gaillard, The Greensboro Four: Civil Rights Pioneers (Charlotte, N.C.: Main Street Rag Publishing Co., 2001); William H. Chafe, Civilities and Civil Rights: Greensboro, North Carolina, and the Black Struggle for Freedom (New York: Oxford University Press, 1980).